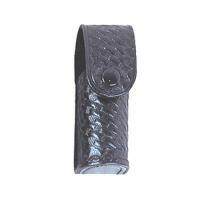 Stallion Leather Punch/Bodyguard 2oz Pepper Spray Holder is manufactured with pride here in the good old US of A! Constructed of genuine leather, the Stallion Punch / Bodyguard 2oz holder has a weltless design with cleaner lines for that stellar dress uniform look. For use with 2 ounce aerosol chemical agents, the pouch will work with canisters sized 3.5" X 1.25". This model uses Dot-brand snaps to protect its user from accidental device discharge while still allowing for safe and easy access. Fits belts of 2.25 inches and less, you can't go wrong with Stallion 2oz Holder.